Adventures in Odyssey Album 60: Head Over Heels is now available for preorder on CBD and Amazon. It is scheduled to release on the OAC in December 2015. The digital downloads will be available in February 2016 and then the CD copies will release on March 1, 2016. Love me . . . love me not? In the world of Odyssey, life’s issues rarely come together without a hitch. For Penny and Wooton, the answer to a marriage proposal leads to even more questions. Will Wooton meet with Penny’s family’s approval? And will Penny believe the best about Wooton even after the evidence seems to pile up against him? Meanwhile, others in town are asking questions of their own: The Parker family wonders if Mom will ever learn how to ride a bike, Whit unexpectedly questions whether his daughter should move to town, and Emily wonders how an unknown hero is thwarting the robberies across town. Throw caution to the wind and find the answers as the folks in Odyssey jump head over heels into the path of truth and discernment. 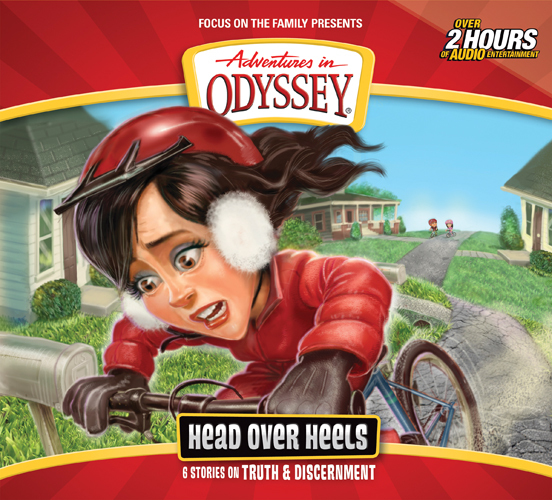 Preorder your copy of Adventures in Odyssey Album 60: Head Over Heels from one our affiliate partners! Thanks!